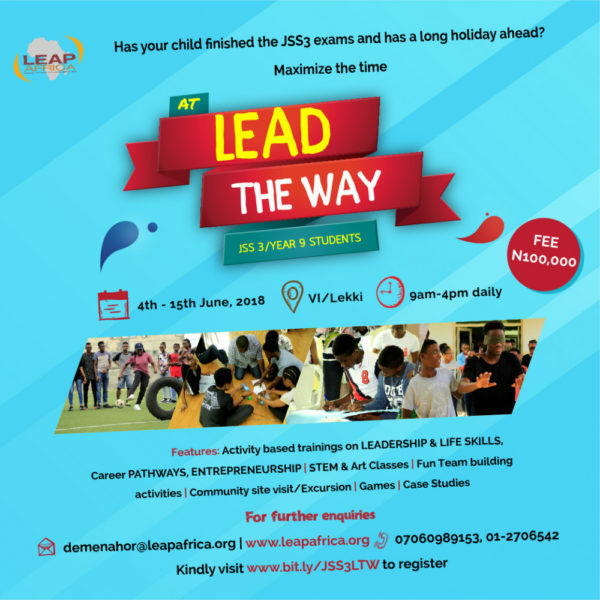 If you have kids in Jss3 who are probably done with exams and need a fun-packed summer programme to keep them engaged, groomed and trained, the LEAP Lead the Way program is a perfect fit. LEAP’s “The JSS3 Lead the Way Programme” is designed to suit your child’s social needs whilst also training him/her on Leadership and Life Skills, Career Pathways, Arts and Crafts, Business enterprise etc. This programme will hold for 2 weeks from June 4th till 15th, 2018. The 1st week (Leadership) will cover our leadership & life skills curriculum and also include a community site visit, activity-based learning and group presentations while the 2nd week (Pathways) will cover a range of activities to complement the week 1 training and give them an edge in a competitive global world. These activities will involve training on Creative & Performing Arts, Tech & Humanities, Career and Enterprise Day. Kindly visit www.bit.ly/JSS3LTW to register or call Daniel Emenahor on 07060989153 or via email, [email protected] for more information.